Check your label, does it say 100% prime white goose down? Kluane Moutaineering was created in 1971 by outdoor enthusiasts who were fed up with the poor quality of outdoor equipment and clothing on the market. They set out to create garments and sleeping bags that actually keep you warm, AND THAT ARE MADE TO LAST!! Our products have been to the top of the highest mountain peaks in the world and both the north and south poles. Our equipment was most recently at the South Pole in 2016 – Well Done Henry!! Born in the imagination of some very talented people and laboratory tested, our sleeping bags are created to have no cold spots, be light and be very compactable. All products are 100% Canadian made in our shop in Edmonton, Alberta to the highest standards with the best materials available. ‘Thank you’ to our local down producers for being able to provide the best quality down in the world!! If shopping for a mummy bag, does it have a foot box? The foot box is an important part of a mummy bag. Our foot box makes it impossible to for your foot to find its way to the cold outside shell of the sleeping bag ensuring warm feet through the night. Whether you are a fan of fiber or down (each has it’s strong points depending on who you talk to – we are just concerned about a manufactured product that’s major selling point is that it is ‘almost as good as down’) you should give some thought as to how you are going to use your gear. Why down? Because we want to produce the best product possible. How important is weight? Will you be carrying it? How important is it that your equipment is compressible? Will you be having to pack it? Our bags use a minimum 850 fill (we often have as high as 900) premium quality prime white goose down. The best available! Produced in Canada! This means greater warmth, less weight, more compressible and longer life. What temperatures are you expecting to use the gear in? 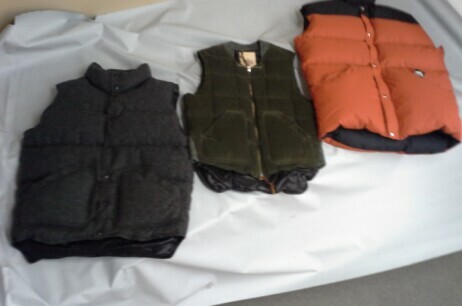 We make bags and parkas for all temperature ratings. Be aware! We do not inflate our temperature ratings to sell our equipment! Although many factors can affect how the human body reacts to cold temperature, we have shown an honest temperature rating for our bags! Is it blue/red/pink/purple/etc.? If color is your concern, you can actually pick your color scheme and we will make your garment or sleeping bag to that specification. Does it have a trendy patch or label? Although we think our label is the coolest ever, if this is your main concern you may be looking in the wrong place. What about fit? Is your body not ‘average’ (like mine). We can adjust our products to fit. I’m 6’5″, it’s so nice to have sleeves and body of a garment that fit and a sleeping bag were I don’t have to sleep in the fetal position to keep my shoulders warm. Have we been on TV or in the movies (like one of our competitors brag about)? Yes. I was once in a trade show and found myself having our product being verbally attacked by a passer by who claimed one of the other displays had a sleeping bag with almost as good temperature ratings for less money. I was surprised as no other manufacture makes a product comparable to our Logan Double. Once the gentleman had moved on, I collected my bruised and shaken confidence and wandered over to, what I believed to be, our competitors display. I was about to start asking questions and prepared to be schooled about what, ten minutes before, I had been so confident in. As it turned out, I didn’t need to even open my mouth, there on display was their ‘flagship’ sleeping bag. A massive fiber/batten filled, two foot thick, rubber coated, non compressible, 30 pound behemoth, that would fill most mini vans to the ceiling and take two grown men to fold in half, let alone roll up. With all my faculties restored, I wandered back to our little booth. Several others brought up the competitions bag that day. My simple reply was ‘yes I looked at that, it would probably keep you almost as warm but it may be difficult to breath under all that weight once you got in’ and ‘I wouldn’t want to carry it any further than from the vehicle to the tent’…If moving it didn’t exhaust you, sleeping under all that weight would. 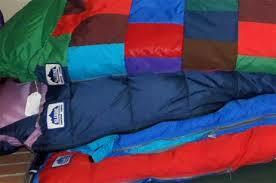 Please remember that constructing the best sleeping bags, quilts and clothing takes time. Although we keep items on hand, our stock is limited. If we have what you are looking for in the shop we will ship immediately. If you are looking for something specific that has to be made we will give our best estimate on delivery at the time of ordering. When ordering mummy bags (except Kaskawulsh), specify left or right hand zipper. The right hand zipper is on your right when lying on your back in the bag. All of our bags can be zipped together for those who tend to get lonely. Due to the tendency of zipper manufacturers to change zipper design, it would be wise not to wait too long before ordering the second bag (or order an extra zipper with your first bag). If you have one Kluane bag and wish to order the mate, please advise us when ordering. Regular Kluane bags fit people up to 6’2″ tall. If you are significantly taller or shorter you may wish to have your bag made longer or shorter than standard. Although some extra length can be nice, especially for winter camping when boots, water bottles and other freezables may be stored in the extra space. Some may find the bottom of the bag colder if it is too long. When ordering parkas, Cagoules and vests – please send measurements for the chest, waist, hips, shoulder width, nape to waist, size of neck, weight and suit/dress size. For chaps and pants, please send the above plus thigh circumference and inseam. For booties, a foot outline will do. For bags with increased length (up to six inches) there is a charge of $45 to cover the costs of extra down, fabric and cutting. For the Logan Double and Kaskawulsh add $55. Prices for bags with increased girth vary and can be provided upon request. Basic apparel alterations usually run $10 to $15 (at time of manufacture). Down fill specified is optimum on the basis of our experience and increased fill will not necessarily increase loft or warmth; however, if you do wish additional down we can do that (at time of manufacture) at a cost of $15 for each additional ounce (28 grams) ordered. Kluane has built an oustanding reputation on the quality of it’s products. Our products are, quite frankly, the finest obtainable anywhere. No other sleeping bags or garments offer the design and construction features or quality of Kluane products. Why Down and not Feathers? Once you have seen a down pod floating in the air you will instantly know why. Virtually weightless, lots of loft and very clean. Feathers (very different from down) are inherently heavier and pack together. They have less insulating properties and can be less ‘healthy’ to wear. Be careful where your jacket or sleeping bag is made and where the manufacturer gets their ‘down’! Our Canadian producers and suppliers take great care to ensure our down is clean!! We strive to make our products as healthy as possible. Natural down has no synthetic ‘off gassing’ to be worried about as you sleep. In Canada a garment must be 75% down to be labeled ‘Down’. If it is less than 75% down then the percentage must be shown (ie 50% down, 50% feathers). But Be Careful! Only 75% of that 50% has to be down. A jacket that has 120 grams of down and 120 grams of feathers, has a total of 240 grams. 90 grams of 240 grams = 37.5% . That is to say, that jacket may have as little as 37.5% actual down. 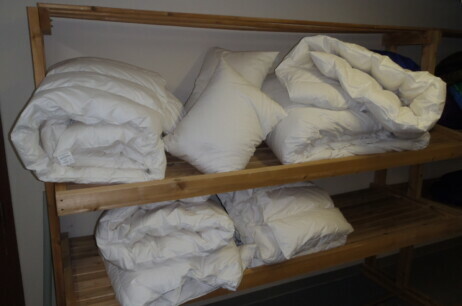 We only use the finest obtainable PRIME GOOSE DOWN in out sleeping bags and garments, and we invite comparison with downs used by other bag and garment makers. Our down fills 850 cu.in. per ounce (and often as high as 900). To increase the efficiency of the down fill, the down for each compartment in Kluane products is calculated in advance and weighed to within 1 gram accuracy before being placed in the compartment. As a result…there are no overfilled or under filled compartments…..in a Kluane product you get Quality!! !